Contact us to find out about future adventures. 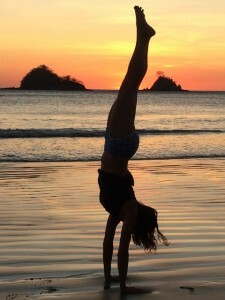 Amy Caldwell (E-RYT 500) has dedicated herself to the practice, study and teaching of yoga since discovering its joys and benefits in 1997 while backpacking throughout Asia, Australia, and parts of Europe. She trained in the disciplines of Ashtanga (Tim Miller, BNS Iyengar), Sivananda (Swami Sivanand, India), Iyengar (Roger Cole, Jo Zukovich) and Anusara (Diana Beardsley) combining elements of these styles into a dynamic and inspiring alignment-based flow. She and her loving husband Michael have studied Vipassana meditation and incorporate its teachings of awareness into Yoga One and life with their two beautiful children. Amy has twice been featured on the cover of Yoga Journal including their 30th anniversary issue, as well as appearing inside for the “Home Practice” section. She collaborated with 3D4Medical in creating iYoga Premium app for iPad and iPhone which reached reached the number one spot for best-selling health and fitness applications worldwide on Apple’s store with over 15,000 downloads in the first month.